Facility coaches canines (and their people) to master the obstacles. The border collies, golden retrievers and terriers racing inside the Doggie U K9 Academy in Bay Shore this afternoon could probably run circles around your average Westminster Best in Show winner. 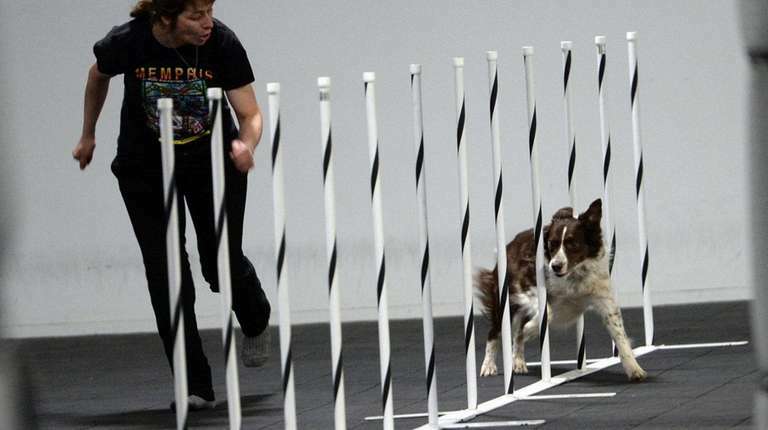 These well-manicured pooches are also athletes who can follow commands on a dizzy-making obstacle course including jumps, poles and tube tunnels. Among the canine/human teams competing today are Carolyn Biondi of Lindenhurst, who tailed right behind, giving voice commands to her 2-year-old border collie, Wish. “She had a good run. She’s learning a lot,” Biondi says after Wish finishes the trial with only one misstep — a missed weave pole. Because Wish is a beginner, the judge allowed a do-over. “She’s here to learn and get some experience,” Biondi says as Wish gobbles up another treat from her hand. In Biondi’s estimation, Wish “has all the potential in the world” in the increasingly popular sport. 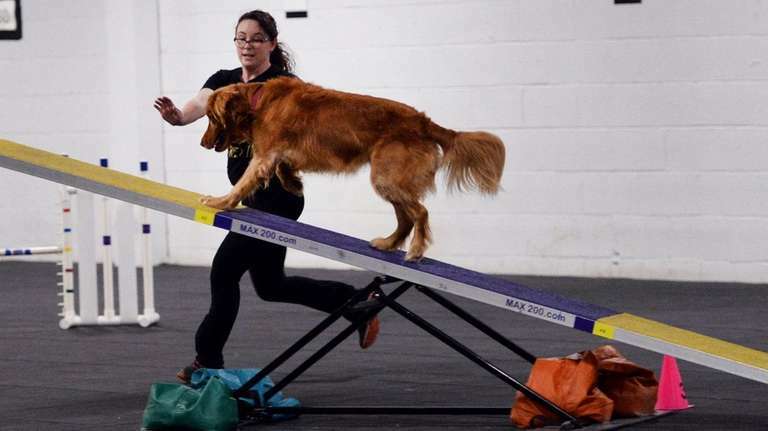 Agility, the Olympics for dogs, is finally getting the attention Long Island dog owners feel it deserves. An agility trial went viral last month in a video spotlighting the amazing speed of Gabby, a tiny 3-year-old papillon handled by Andrea Samuels of Westbury. Gabby zipped through the Sixth Annual Westminster Masters Agility Championship course in 39.31 seconds, winning the 8-inch division. “It keeps Gabby mentally and physically active,” says Samuels, 42, a dog trainer and groomer. Training Gabby has also helped Samuels lose 20 pounds as she circles the ring behind her pet. 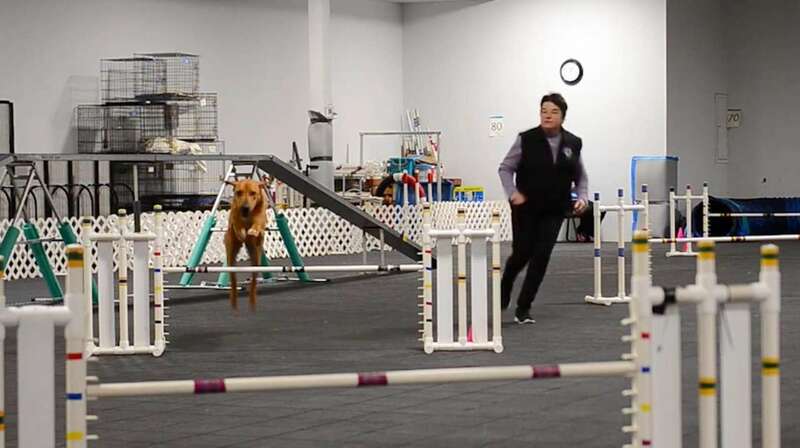 Unlike breed-conformation events, “agility is for everybody” — pure and mixed-breeds, altered or neutered, says Rolissa Nash, co-owner of Doggie U. In agility trials, dogs compete for points on a course including jumps, weave polls (similar to slalom skiing poles) and tubelike tunnels. The rewards include treats, rosettes and trophies. 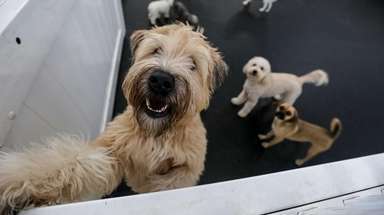 “It’s America’s Got Talent with a twist,” according to Nash, who says she founded the gymnasium-like 13,000-square-foot facility to train her own pets, which currently include her tiny bear terrier, Tout. Dogs come to the academy from about two dozen agility dog clubs on Long Island, Nash says. Agility trials are also about building pet-owner relationships and doggy self-esteem, experts say. “There’s a very strong bond that forms between handler and owner, and that is made better and stronger by performing in competition, where the emotions are running higher,” says Paul Mount of Morganville, New Jersey, who judges Long Island events for the American Kennel Club and UK Agility International, which offer agility trials in the metro area. Amanda Muller, 28, of Mastic, brought her golden retrievers, Paisley, 4, and Paige, 2, to the recent agility trials. The dogs also train on a jungle gym in her backyard and, in the summer, on a Yaphank farm, Muller says. Both Paisley and Paige were jumping on their owner and seemed eager to get into the ring with her. “Paisley loves to just run, it lets her open up and move as fast as she can,” Muller said as they waited in the Doggie U crating room for their turn in the ring. “Paige is still getting comfortable in the ring,” added Muller. She’s hoping to go beyond local events to take both dogs on the road to national competitions.